The focus of the study is the non-isochemical recrystallization of feldspars and the deformation mechanisms that drive the recrystallization. Melt infiltration in the area of upper mantle influences the deformation mechanisms of mantle rocks. This can be studied by detailed microstructural analysis on mantlexenoliths. Eclogites and HP-granulites form in a subduction zone setting. During exhumation these rocks suffer retrogression that leads to symplectitic overgrowth of some minerals. 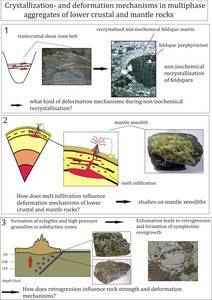 The effect on rock strength and deformation mechanisms is unknown and should be studied. Beside the literature research for my PhD, I started a study that is based on the results of my Diploma thesis “Petrological and microstructural studies on garnet bearing high grade rocks from South India”. The thesis was focused on the petrological conditions of the shear zone activity in the Cauvery Shearzone System by using garnet zonation patterns and geothermobarometers. To complete the results further geochronological and geochemical investigations are planned. For this purpose I did literature research and started sample analysis by using a polarization microscope. Although this work is not directly linked to my PhD thesis, it will enrich my knowledge in geochemistry, geochronology, and microstructural geology. Furthermore, I will learn new measuring technologies and make first experiences in scientific working. For the financing of my PhD position, me and my supervisor Prof. Dr. Kleinschrodt elaboratedand submitted a DFG proposal. I participated in several activities offered by the Graduate School of Geosciences such as the Geosciences Colloquiums and the Induction meetings. Unfortunately I was not able to participate in more activities since I went on a journey to New Zealand. But during my stay in New Zealand I was able to improve my English skills, which is very important for scientific working.